What trends have you seen during your hospitality career? Over the years, balloons have become less popular, but chair covers have always remained a must! Chocolate fountains are rare now, but sweet carts and tables are very much in demand. Generally, weddings have got smaller than they used to be. This intimate atmosphere is a real shift from previous years and many couples often want a smaller guest list for the day, increasing to a bigger party in the evening. What has been your stand-out wedding memory at Langstone Cliff Hotel? We have hosted more weddings than I can count here at Langstone, but my stand-out wedding memory has to be my daughter’s special day. Not only was I mother of the bride, I also took on the task of organising everything! Because it was my own daughter, it made for an interesting experience. Weddings can be very stressful at the best of times, that’s why it’s so important to have a coordinator to help. Because it was my own daughter’s day I had a little bit more to think about! It was so worth all the worry but thanks to the team and my knowledge of the venue, everything went perfectly, and I got to enjoy the day which is fantastic. 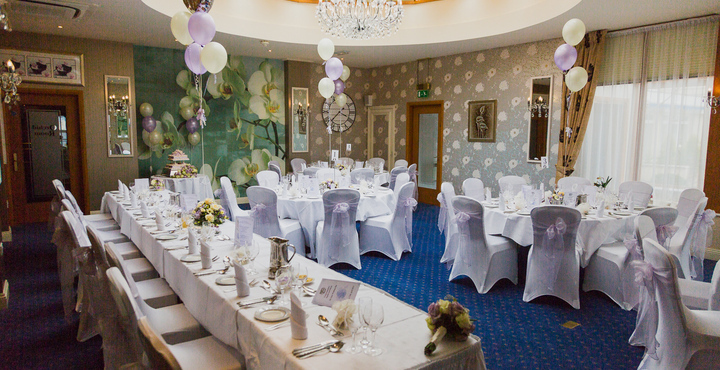 What sets Langstone Cliff Hotel apart from other South West wedding venues? We are extremely flexible – nothing is set in stone. When I speak to couples I hear all too often that other venues are often restrictive in their offering and packages. That’s simply not the case at the Langstone Cliff Hotel, and it never has been. All our menus can be mixed and matched for an individual quote, and we don’t ask for a pre-order (unless numbers are less than 20). This saves on a huge headache for the happy couple. Their guests just chose what they want to eat on the day and the feedback we have for operating this way is fantastic. What would be your key advice for couples struggling to choose a wedding venue? After deciding to get engaged, picking a wedding venue is one of the biggest decisions you will make. It informs the atmosphere, your photographs – everything! Make sure the venue you choose can adapt to what you want on the day – what’s the point in having a set of rules you have to stick to? There is of course etiquette, but I strongly believe that it is their day, and this doesn’t have to be adhered to if they are not comfortable with it. Bespoke is a word that gets used a lot when wedding planning, but I have to say that if you have a Langstone Cliff wedding, every part of the day will be exactly as you want it to be. If you’re looking to host your big day in South Devon, hotels by the sea such as ours are the perfect spot for picturesque photographs. You can find out more about our wedding packages here. If you are searching for ideal unique wedding venues, Devon’s pride and joy has to be the Langstone Cliff Hotel, call Louise on 01626 868000.